This article is about the former American department store. For the Algerian city formerly called Maison Blanche, see Dar El Beïda. For the Paris Métro station, see Maison Blanche (Paris Métro). 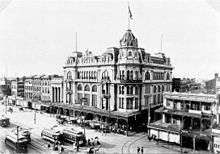 Maison Blanche (White House in French) was a department store in New Orleans, Louisiana, and later also a chain of department stores. It was founded in 1897 by Isidore Newman, an immigrant from Germany. Maison Blanche is perhaps best remembered for introducing the locally popular Mr. Bingle Christmas mascot and for its landmark flagship store on Canal Street. Maison Blanche was acquired in 1923 by City Stores Company, which merged Maison Blanche with Loveman's in 1950. City Stores Co. filed for bankruptcy in July 1979. While in bankruptcy, they initially intended to consolidate the seven Maison Blanche stores with four B. Lowenstein's stores in Memphis, Tennessee, to form the Maison Blanche Department Stores group, but in early 1982 the Memphis stores were shuttered. Instead, three of the seven existing Maison Blanche stores, as well as the name, were purchased by Goudchaux's, Inc. of Baton Rouge, owned by the Sternberg brothers. (Goudchaux's should not be confused with Godchaux's, a specialty store based in New Orleans). 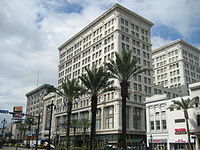 Operating as Goudchaux/Maison Blanche, the new company eventually reopened the original Canal Street flagship in 1984, leasing three floors from the new owners. In the late 1980s, two Florida-based retail chains were purchased, allowing the company to enter the fast-growing Florida market. In 1987 Goudchaux/Maison Blanche acquired the ten-unit Robinson's of Florida on Florida's Gulf Coast from May Department Stores; in 1988 they also bought the five-unit Jacksonville-based "May Florida" (formerly May Cohens) from May. The Goudchaux name was dropped at this time and all the stores were renamed Maison Blanche. But the rapid expansion coupled with the oil-related recession in Louisiana proved to be too much for the company to manage, and in 1991 Maison Blanche sold eight west and central Florida stores to Dillard's, leaving it with eight Louisiana stores and eight Florida stores. Maison Blanche was purchased by Mercantile Stores Inc. in February 1992 as a 16-store unit. 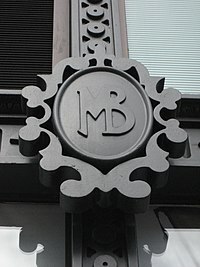 The eight Louisiana stores continued to operate under the Maison Blanche name, until Mercantile Stores was acquired by Dillard's in 1998. Dillard's subsequently closed the Canal Street store after briefly operating it. The acquisition of Maison Blanche came nearly a decade after Dillard's had purchased another New Orleans area retail institution and Canal Street landmark — D.H. Holmes. Maison Blanche's original building was on Canal Street. This was demolished around 1908. A distinctive new building, which still stands, was constructed around 1908–1909. At one time there were many medical and dental offices in the top floors; later they became largely empty. The Canal Street store was closed in 1982 by the City Stores Company and reopened in 1984. In 1997 work began to use the upper floors as part of a new Ritz-Carlton hotel. The original plan was for the lower floors to continue to operate as a Maison Blanche department store. However, after Dillard's acquired the store with the purchase of the remainder of the Maison Blanche chain, they closed the Canal Street store. The whole building, along with the neighboring Kress building, is now part of the New Orleans Ritz Carlton, which had a grand opening on October 6, 2000. The hotel was occupied during and immediately after Hurricane Katrina. It suffered considerable damage; for example the basement was flooded and the electrical systems, laundry, and staff cafeteria, among other things, were damaged. The Ritz-Carlton reopened on December 4, 2006, after a $106 million refurbishment. ^ Blake Ponchartrain Archived 2007-01-02 at the Wayback Machine, Gambit Weekly, December 25, 2001. Last retrieved January 21, 2007. ^ Native Mr. Bingle, The Hometown Tradition, New Orleans Magazine, December 1989. Last retrieved January 21, 2007. ^ Mercantile Stores Co. reports earnings for Qtr to Oct 31, The New York Times, November 14, 1992. Last retrieved January 21, 2007. ^ Canal Street - Picture 172[permanent dead link], University of Illinois at Urbana–Champaign. Last retrieved January 21, 2007. ^ Downtown Rebound, Gambit Weekly, July 8, 1997. Last retrieved January 21, 2007. ^ Reinventing The Ritz, New Orleans Tourism Marketing Corporation, December 2006. Last retrieved January 21, 2007. Wikimedia Commons has media related to Maison Blanche, New Orleans. This page was last edited on 22 December 2018, at 19:47 (UTC).